Natalie Litwiller of the University of Findlay had perhaps the most successful weekend of any western rider save for AQHA Cup winner Sarah Elder. Murfreesboro, TN - Ohio State could claim one. Kansas State could claim one. The University of Findlay could claim three. 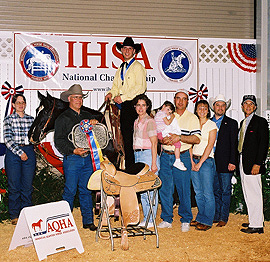 Of the five undergraduate individual stock seat classes held at the 2003 IHSA National Horse Show, three of the classes went to members of the Findlay oilers, with a fourth member of the team also able to place high up with a third. Natalie Litwiller, a senior from Grants Pass, OR had perhaps the best weekend of the foursome, winning the National Reining Horse Association reining pattern section while placing third in the AQHA Cup Competition the next day. Considering the adversity the oiler's program had been through in 2002-03, their performance was all the more extraordinary. An equine herpes outbreak on campus played havoc with the Zone 6, Region 3 show schedule, rendering the Findlay facilities and horses unusable from late fall through much of the spring. The stock seat team, like the hunter seat, still won the region, but following what was a second place performance at Zone 6 Zones (good enough for the stock seat team to advance to IHSA Nationals) the oilers were informed that one of their riders had been deemed "Misclassified" (riding at a level lower than they really belonged). By having to take a zero instead of a second in that class the oiler point total fell just enough to lift third place Midway College from Zone 6, Region 2 above them. This discovery came painfully close to the start date for Nationals, too late even to correct the show program. Still, the Findlay coaching staff and their four western riders accompanied the hunter seat team and staff to Murfreesboro and delivered the goods! Intermediate western horsemanship, the first undergraduate individual western section of Nationals, was one of two without a Findlay rider in the ring. Held four classes after the opening ceremonies (which came following two hunter seat jumping classes), the results of intermediate western were read from "Participation Level" backwards to first place. As each rider received their ribbon they rode out of the ring, making it easy to see one by one who was still "out there." Following the six participation ribbons it turned out that tenth place went to Emily Krach of Ohio University - Southern Campus. The sophomore was the lone participant from the school in Ironton, OH, coached by Janice Rosier. Sophia Stolarcyk of the State University of New York at Morrisville was ninth, but would not be the last of coach Bonnie Miller's mustangs to place in the top ten. At least two community colleges were represented in the division, with Southeast Community College sophomore Brandi Salestrom earning the eighth place ribbon. For those wondering, Southeast Community College is located in Beatrice, NE and competes in Zone 9, Region 3 (Whitney Eisentraut of Bucks County Community College in Newtown, PA was the other community college rider, though she only reached participation honors here). Emily Novak of Ohio State placed seventh, becoming the first buckeye rider to pin at 2003 Nationals. Sixth went to Erica Bechtel of Kutztown while University of Montana junior Ashley Ascione earned fifth. Luann Ulrich of Oklahoma State, the first of coach Larry Sanchez's riders to participate, placed fourth. The junior from Fairview, OK had won the team intermediate western class at 2002 Nationals. Julianne Lafrenz was part of the largest Cazenovia western contingent to ever show at Nationals, as the wildcats had a full stock seat team in attendance for the first time. Coach Brian Maxwell saw Lafrenz place third, the first of four wildcats to place individually. University of the South junior Rebecca Tolbert was reserve, becoming the first sewanee undergraduate western rider to make the top ten since Kate Elliott was eighth in individual open reining three seasons ago. Listed as both a sophomore and a junior in the Kansas State media guide, Elaine Cobb described herself as a sophomore (it is her second season on the team). Cobb said this upon being photographed following her victory in intermediate western. Ironically, the wildcats edged the wildcats in this class, as both Kansas State and Cazenovia have the same nickname. From left to right are Kansas State head coach Lindsay Breidenthal, Elaine Cobb & Cobb's parents. Cobb, from Lenexa, KS won the individual intermediate western division. 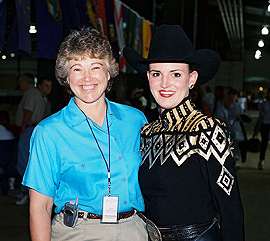 The tenth of thirteen classes held on day one of the 2003 IHSA Nationals was individual open western horsemanship. It is at this point that the Findlay riders rose to the top. As was the case in intermediate, there were sixteen riders in the class, two from each zone excluding Zone 1 (most of New England), which to date does not have any regions with western. Tenth place went to Nikki Yocks of Murray State, who had the distinction of finishing second in the Zone 5, Region 1 open rider standings to Sarah Elder, though they were separated by over 60 points! Zone 4 can claim only one region currently holding western classes. This would be Zone 4, Region 1, which has been dominated by the University of Maryland since western commenced there in 2000. However it would be College of William & Mary junior Blair Costin placing ninth here and also representing the region in the AQHA Cup competition. Costin would also ride in the NRHA reining class, but her ribbon here would be the only one for Zone 4 above the participation level. Katie Forest of Texas A & M scored a eighth here, but would place higher in each of the other three classes she would ride in during the weekend. Kim Wingfield, a senior at Ohio State would place seventh and like Costin and Forest would ride in the AQHA Cup class. Amber Brandt, a junior who would provide most of the fireworks for coach Cindy Durham's Saint Mary-of-the-Woods college team, placed sixth here. Debby Boardman of S.U.N.Y. - Morrisville was yet another mustang in the ribbons with a fifth. Brandi Vogel, who won the individual advanced western last season, was not able to duplicate the feat at the more difficult open level. The Kansas State junior was fourth, still giving head coach Lindsay Breidenthal top four placings in the first two individual classes. Middle Tennessee's Elder, who won both open level team classes as well as the 2003 AQHA Cup was human here, only earning a third. Tayla Dunn of West Texas A & M was reserve, the first of coach Rebekah Bachman's buffs to earn a ribbon at Murfreesboro during what would become the greatest weekend in the history of their equestrian program. Findlay coaches Cindy Morehead, Steve Brown and Clark Bradley did a great job in recruiting the current oiler stock seat team, bringing in riders from across the land. While Litwiller is from Oregon, sophomore Amanda Bergman is from Marengo, IL, and Bergman is the 2003 individual open western horsemanship champion, an improvement from fifth place in the same division a year ago. Saturday was privy to only one individual western class, the National Reining Horse Association open reining pattern. Named for the organization that sponsors the class, the individual open reining was the last of the five western classes to feature sixteen riders. Tenth place went to Kansas State's Vogel while Trisha Keller the University of Wisconsin at River Falls placed ninth. Keller had placed third in team open reining at the 2002 National show. University of Oregon sophomore Carrie Dinsmore picked up the best western ribbon for a school from the Pacific Northwest up to this point by placing eighth. Ken Copenhaver was head coach at Miami of Ohio part of the '70's and '80's. Last seen at 2001 Nationals (when he was one of two stock seat judges) Copenhaver returned this season as the proud parent of Wesleyan College junior Jackie Copenhaver, who took seventh here. Forest of Texas A & M picked up her third ribbon of the entire show with a sixth. Laine Hendricks of Bakersfield College was fifth, and like Copenhaver and Forest, had ridden in the AQHA Cup Class. 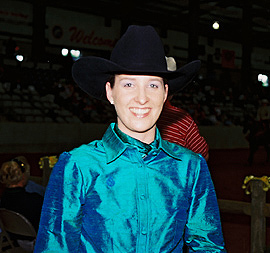 The only rider to make the top seven in the NRHA that could not claim an appearance in the 2003 AQHA Cup was Tannetje' Mayuex of Texas A & M. The senior from Roanoke, TX who pronounces her name "Tan-asia May-you" bested her more productive teammate Forest head-to-head in the former's swan song for the aggies. Though she would ride two more times before the show ended, Elder picked up her final IHSA ribbon below the first place level with another third. University of Louisville's Rusty Rea, who many feel was robbed of getting to Nationals in open western horsemanship following a great ride at Zone 6 Zones was reserve. Litwiller, still destined to be third in the AQHA Cup the next day, brought home the second blue ribbon for the Findlay western collective, winning the NRHA Morrison Bronze Reining Trophy, not to mention the Tex Tan saddle that each of the five individual stock seat class winners receive. Seen here with head coach Anne Brzezicki, Sarah Elder of Middle Tennessee State was third in both individual open western classes. The beginner western horsemanship was the fourth of five undergraduate individual stock seat classes, and the third to last class of the entire three-day show. Starting around 3:00PM on Sunday, the beginners played to perhaps the smallest crowd of the weekend. The hunter seat team competition had ended four classes earlier, and the stock seat team competition two after that. Many of the schools with full teams had planes to catch, while others simply vanished only to return around 5:00PM for the closing ceremonies. Still the beginners were in the ring almost as long as the other western classes, as each horsemanship section was divided between riding along the rail and individual patterns. There was no representative from Zone 4 (no one in Zone 4, Region 1 earned enough points at the beginner level to qualify for regionals) which meant only fourteen riders in the ring and the smallest undergraduate stock seat class of the show. Tenth place went to Jon Convis of Cazenovia while University of the South senior Jenny Sinclair was ninth. Oklahoma State was one of three schools with two riders in the class of fourteen (Findlay and California University of Pennsylvania were the others), and sophomore Laura Brawdy was the first of two cowgirls to receive her ribbon, placing eighth. Seventh went to Katie Schie of Cornell, making the trip to Murfreesboro very successful for the big red indeed (Cornell had three riders, two english and one western and all made the top ten, including hunter seater Gillian Pech doing it twice). University of Nebraska at Lincoln senior Tara VanDeWalle was sixth while Black Hawk College sophomore Clayton Hall was fifth. Oklahoma State's April Peck was the other cowgirl in the class, placing fourth. 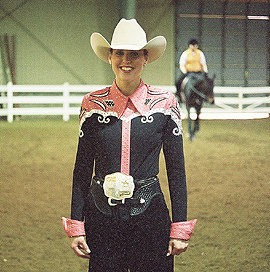 The sophomore from Coweta, OK had placed first in team beginner western at the 2002 IHSA Nationals in Cazenovia, NY. Third was the first of two Findlay riders in the top three. Sara Umberger, a sophomore from Cranberry Township, PA was third for the oilers while Mallory Salcedo of Cal Poly-Pomona got caught in the oiler sandwich, winning reserve honors and the last ribbon for departing bronco head coach Jerry Liberatore. Findlay's Corey Hartman, a junior who won the team beginner western at 2002 Nationals, kept his undefeated record intact with another first here. Hartman also became the only Findlay rider actually from the state of Ohio to win a western class at this season's Nationals in the process. Corey Hartman of Findlay (on horse) has never lost a class at IHSA Nationals (in two tries). The individual advanced western followed. The final western class, and the next-to-last class of the entire show (before individual open flat) was held in front of roughly the same number of attendees as the beginner section. Jillian Kimball of Ball State was tenth out of the fifteen qualified, while Jennifer Sykes was the first of two Cazenovia wildcats in the class to make the top ten. Maria Paxton of Ohio State was the first of two buckeyes to place, the senior ending her IHSA days with an eighth. Jessica Isbrecht was the lone University of Delaware blue hen to place above the participation level, english or western, when she placed seventh here. Western Kentucky head coach Charles Anderson did not have a rider to coach until the last two stock seat classes. Junior Mandy Smith made the wait worth it with a sixth. Miranda Dickson of Colorado State became the only rider from Zone 7, Region 1 to make the top ten individually on the western front with a fifth. Kristin Lajeunesse was the other Cazenovia rider in the class, ultimatly placing fourth. University of Georgia freshman Ashley Slocumb was third while Texas A & M junior Jamie Mischler was the icing on the cake for the co-national champion aggies. Coach Tana Rawson had to head for the winners' circle for photos yet one more time as Mishler took home the reserve ribbon (Rawson and the rest of the aggies would have to pose for even more photos at the closing ceremonies). Ohio State sophomore Rebecca Johnson sent the buckeyes out on a positive note, with a first. Johnson's blue ribbon was surprisingly the only first of the entire show for Ohio State, with coaches Ollie & Debbie Griffith guiding the buckeyes to fourth in the western team competition. Still, it meant four first place ribbons for the state of Ohio in individual western classes, not to mention four hunter seat team classes going to Ohio schools (three for Findlay, reserve national champs in hunter seat and one for Miami of Ohio). 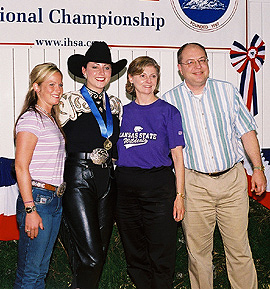 Fast Fact: Although Zone 7 dominated the team competition, 2003 IHSA Nationals marked the first time since 1994 that no rider from Zone 7 won an individual class (ironically, the '94 nationals were held at Texas A & M and the co-champions then were Colorado State and Texas A & M, both from Zone 7). Kansas State was in Zone 7 last season, so Cobb's win would have represented the zone had the IHSA not expanded over the previous summer. Room for improvement: Only two of the ten Zone 3 entries placed inside the top ten. Only one of the seven Zone 4 rides resulted in a top ten placing. By contrast, all ten of the Zone 6 entries placed inside the top ten, with four placing first! Though the buckeyes have won seven team national championships since 1991, Rebecca Johnson's win in individual advanced western was the only class of the entire show won outright by Ohio State at 2003 Nationals. Time and time again: The three day show was the largest as far as number of competitors and the longest in actual time to date. Part of the reason for this was the tremendous increase in the number of western team participants for each class, up from fourteen to seventeen. Taking into account that each western class save for the reining is actually two separate sections and the time it takes to compute the combined judges scores one can realise that western classes accounted for as much time in the ring as english, despite the existance of only five (undergraduate) western divisions versus english divisions. Nationals started at 8:53AM on Friday and day one was complete at 9:59PM (the longest Friday session ever). Day two started at 8:23AM and ended at 10:09PM (not a record, for the record!). Day three, which was made up of two fewer classes was the quickest, starting at 8:09AM and ending at 5:49PM, though the closing ceremonies did take place after 6PM. In many cases the duration of the day impacted attendance, as some were able to gage if they had enough time to leave the Tennessee Miller Coliseum for sight-seeing, meals, sleep, etc, which more often than not they did. While attendance was very high during the Friday session, many left for large chunks of the day on Saturday and Sunday. Two ideas have been discussed, in an effort to shorten the days and give spectators, family and friends the opportunity to do other things, at least in the evenings. One is to make IHSA Nationals a four-day show, which many are opposed to as it is more costly to the schools not to mention the time spent out of the classroom around finals for the participants. Next season may or may not see a better idea implemented that was used in Los Angeles in 1996 and North Hadley, MA in 1997. At each of those National shows the hunter seat and stock seat classes were held simultaniously in separate rings (though rain caused the 1997 stock seat classes to be delayed while the hunter seat people used the Mount Holyoke indoor ring for the early part of day one). Though it is still under construction at the moment, there will eventually be an outdoor covered ring a few feet from the Coliseum that could house some of the classes, allowing overlap to occur. Either way, both ideas are good ones and it is hoped that one or the other will be in place when Nationals return to Murfreesboro next May. Individual intermediate western horsemanship: 1. Elaine Cobb, Kansas State University. 2. Rebecca Tolbert, University of the South. 3. Julianne Lafrenz, Cazenovia College. 4. Luann Ulrich, Oklahoma State University. 5. Ashley Ascione, University of Montana. 6. Erica Bechtel, Kutztown University. 7. Emily Novak, Ohio State University. 8. Brandi Salestrom, Southeast Community College. 9. Sophia Stolarcyk, State University of New York at Morrisville. 10. Emily Krach, Ohio University - Southern Campus. Individual open western horsemanship: 1. Amanda Bergman, University of Findlay. 2. Tayla Dunn, West Texas A & M University. 3. Sarah Elder, Middle Tennessee State University. 4. Brandi Vogel, Kansas State University. 5. Debby Boardman, State University of New York at Morrisville. 6. Amber Brandt, Saint Mary-Of-The-Woods College. 7. Kim Wingfield, Ohio State University. 8. Katie Forest, Texas A & M University. 9. Blair Costin, College of William & Mary. 10. Nikki Yocks, Murray State University. National Reining Horse Association open reining pattern: 1. Natalie Litwiller, University of Findlay. 2. Rusty Rea, University of Louisville. 3. Sarah Elder, Middle Tennessee State University. 4. Tannetje Mayuex, Texas A & M University. 5. Laine Hendricks, Bakersfield College. 6. Katie Forest, Texas A & M University. 7. Jackie Copenhaver, Wesleyan College. 8. Carrie Dinsmore, University of Oregon. 9. Trisha Keller, University of Wisconsin at River Falls. 10. Brandi Vogel, Kansas State University. Individual beginner western horsemanship: 1. Corey Hartman, University of Findlay. 2. Mallory Salcedo, Cal Poly - Pomona. 3. Sara Umberger, University of Findlay. 4. April Peck, Oklahoma State University. 5. Clayton Hall, Black Hawk College. 6. Tara VanDeWalle, University of Nebraska at Lincoln. 7. Katie Schie, Cornell University. 8. Laura Brawdy, Oklahoma State University. 9. Jenny Sinclair, University of the South. 10. Jon Convis, Cazenovia College. Individual advanced western horsemanship: 1. Rebecca Johnson, Ohio State University. 2. Jamie Mishler, Texas A & M University. 3. Ashley Slocumb, University of Georgia. 4. Kristin Lajeunesse, Cazenovia College. 5. Miranda Dickson, Colorado State University. 6. Mandy Smith, Western Kentucky University. 7. Jessica Isbrecht, University of Delaware. 8. Maria Paxton, Ohio State University. 9. Jennifer Sykes, Cazenovia College. 10. Jillian Kimball, Ball State University.